Earthquakes are almost a daily occurrence for a few of us (the 1% that live near edges of tectonic plates) and a huge scare for the 99% that never had to deal with the consequences of the most destructive of natural disasters (or very close to that). The most annoying and disturbing fact about earthquakes is that they have the potential to strike anytime/anywhere, hence prepping for an earthquake should be taken seriously by everyone, regardless of your location. Since we can’t predict (yet) earthquakes, we must be prepared in advance for such an unpleasant and potentially catastrophic event and the safest thing to do is to procure (buy/DIY) earthquake kits for you and your family. Obviously, just stashing earthquake kits/supplies will not automatically save your life in case SHTF, but we’ll get to that in a jiffy. 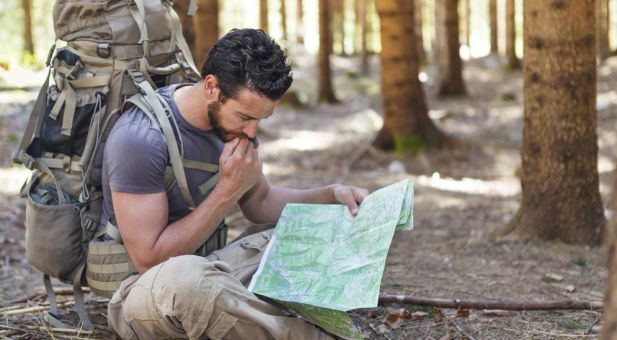 If you’re waiting for the big one or you’re just the average Joe concerned about surviving in the aftermath of a disaster, you should be aware of the fact that when it comes to prepping, regardless of what you’re prepping for, you must follow the same path. That’s because the basics of survival are the same in any situation, they never change : we need food, water and shelter in order to survive after a disaster, a natural (like an earthquake) or a man-made one (EMP/Nuke strike etc). 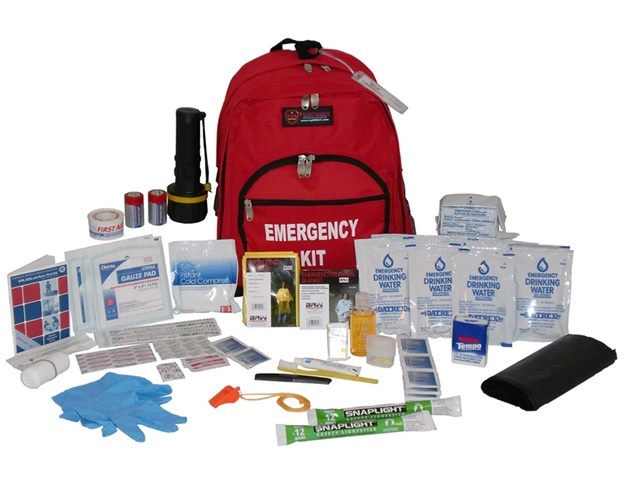 Hence, earthquake kits must contain emergency supplies that will allow you to stay alive for a minimum of three days in the worst case scenario that usually follows a big quake, i.e. your home is inhabitable, there’s no running water, no power, no gas, no food in your local Seven-Eleven and so forth and so on. Don’t put your faith in the government (they are well known for their incompetence when it comes to almost anything) and start to assemble your earthquake kits today! It’s better to be prepared for a disaster that will never occur than vice-versa, don’t you think? Like, it’s better to be safe than sorry; for example, just because you’re wearing a seat belt doesn’t mean that you’ll crash your car today etc. It’s common sense, really. The stuff of life, is an essential item to stockpile for when SHTF. Since we can’t live without water (not for long anyway, 2-3 days tops) you should prepare your earthquake kits with at least a 3 days water supply per person. That means somewhere around one gallon of water/person/day. I know, it sounds like a lot and it is a lot. 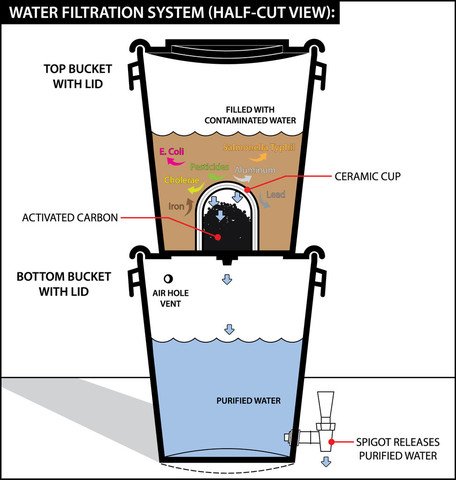 If you’re in a tight spot, you can use the water from toilet tanks, water heaters, melted ice cubes or, if the situation is grim, hell, even the water in swimming pools can be used for survival if you have the means to disinfect it/purify it (there are some chemicals in pool water, like chlorine, to keep it safe). Another must-have item in any respectable bug-out bag/earthquake survival kit. You must have enough non perishable foods in your BOB/stash to last you for at least three days (you and your family). The best choice is to get yourself enough freeze dried foods or canned stuff to last you for a whole week. Pay attention to the shelf life of your stash and rotate your food supplies on a yearly basis (the FIFO thing). will come in handy and also a little bit of self-education watching YouTube vids about CPR techniques and what-not. A first aid kit must contain betadine solution (used by hospitals to murder bacteria; it’s the best stuff there is), a suture kit + surgical gloves for sewing up deep cuts (it’s relatively easy, it’s all on YT folks), super-glue (when you don’t have the time/skill/gear to perform a suture), Quiklot for stopping the bleeding (it’s a little sponge), IBD (a sterile bandage used by the IDF, an awesome life saver proved in many battles that keeps GIs alive after being wounded until MedEvac’d), antibiotics( you can get those from pet stores, they use the same stuff as humans and you don’t require a prescription, check that out ), painkillers and that’s about it. Clothing and bedding, sleeping bags, rainwear, blankets, heavy clothes, work gloves, a fire extinguisher, a good utility knife, tools to turn off water/gas pipes, matches, a portable radio, TP, a solid shovel, soap, duct tape, rope, some cash would be nice too. Your important documents must be kept in a fireproof box/safe deposit box. Enough with the earthquake kits, gear and stockpiling like there’s no tomorrow. Maybe the most important thing a prepper should achieve is situational awareness, the key to survival in any disaster scenario. The first thing to contemplate is the seismic activity in your area. You must have a plan for your family on where to go, where to meet etc. if you can’t get home. Always know where you can find an emergency medical facility in case SHTF, also the nearest police/fire stations. Start imagining what would happen if an earthquake strikes as we speak. Use your brain, think about what to do, where to go, how to react; in this way, you’ll not be surprised when the real one strikes! Yeah, it’s called mind-prepping and it works. If it works for your biceps, it will definitely work for your mind-prepping, don’t you think? 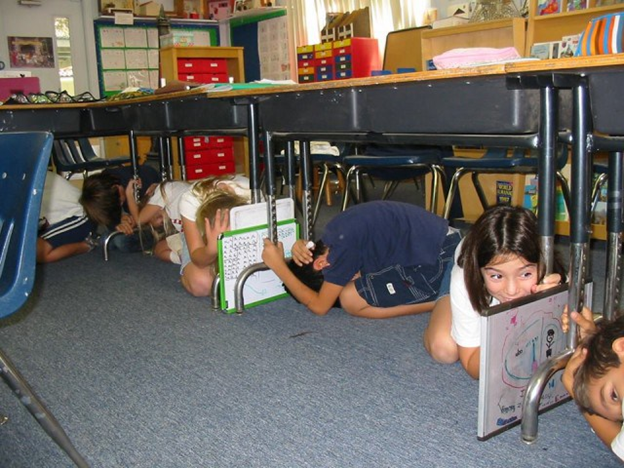 You can practice earthquake drills with your kids and your neighbors. In case you’ll need to evacuate, discuss where to go and practice what you preach! Practice makes perfect, remember that. Take care of the potential fire risks, such as leaky gas pipes/connections and faulty electrical wiring. Installing a smoke detector would be a good idea. Be aware of the danger spots in your home/place of business. All the tall and heavy furniture that may fall on you in case of a quake must be secured. In case of SHTF, stay clear of the fireplaces, windows and appliances. Basically, stay away from anything that may fall on you, it was scientifically proven that heavy objects falling on your head may produce injury and even death, remember that folks! If you’re indoors and the disaster strikes, it would be advisable to stay indoors and face the music. Avoid panicking and running out the stairs. 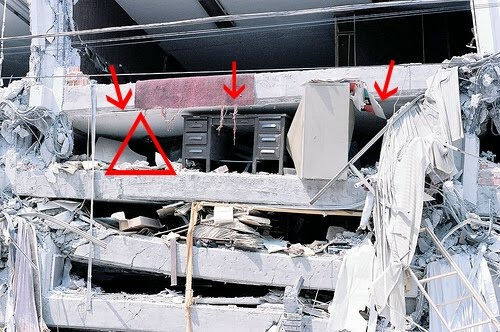 You should try to find a “sweet spot” (under a solid desk, for example or against an inside wall), hit the deck and cover your a*s.
Which brings me to the “triangle of life” thing, a very popular theory (in some circles) about the “how to’s” of surviving a major earthquake. Its proponents suggest that the old “duck and cover” routine is not good enough for surviving an earthquake, as it actually leads to lots of unnecessary deaths; according to the triangle of life theory, you should find yourself a large/strong object/piece of furniture and sit next (not under it) to it in a fetal position. Being large and strong, the respective object will not be compacted by the weight of the collapsed ceiling/walls/whatever and it will protect you by creating a “sweet spot”, a buffer/survival space, a triangle of life sort of speak. Thus thou shall not be crushed, says one of the hard-core promoters of this theory, a quack-scientist named Doug Copp. If you’re living in the US, just stick with the “Drop and cover” routine. Copp’s theory may work only when it comes to buildings that totally collapse/implode during an earthquake (read third world and mud huts). This is not the case with modern buildings that are designed to withstand the seismic risks in the area. 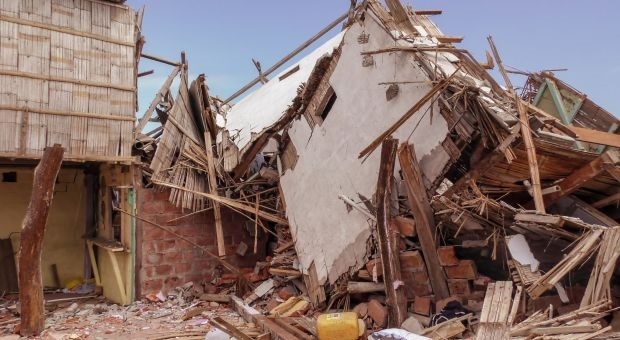 In the US and most of the western(civilized) world that lives under building codes, the largest death toll from earthquakes is due to falling debris that kill people while trying to escape from the respective buildings. As the Red Cross puts it bluntly : “It’s not the shaking that hurts. It’s the stuff that falls on your head’. If you’re outside during the earthquake, keep calm and carry on, get into the open, as far away as possible from power lines, buildings, bridges, overpasses, light posts etc. 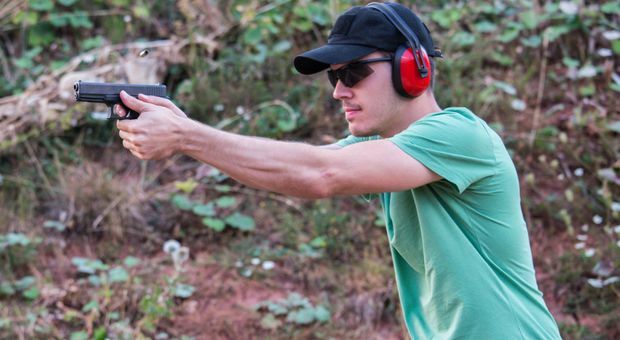 The same principles apply when outside : you must avoid being hit by heavy falling objects; it’s as simple as that. Remember that in the US and in the civilized world generally speaking, the number of deaths due to earthquakes is relatively low; it’s the aftermath of the disaster that should concern you. 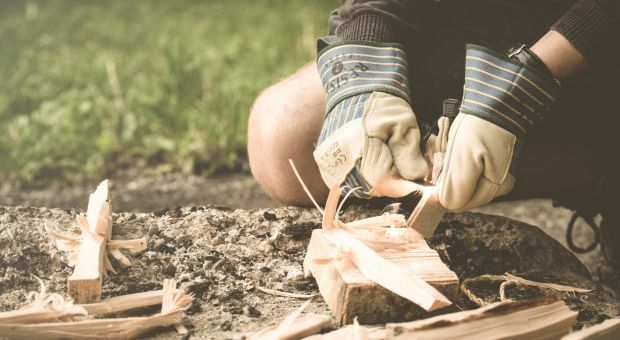 After SHTF, you may find that there’s no house to return to and all of your belongings are dead and buried. Literally. So, start prepping now, tomorrow never knows! I hope the article helped. If you have questions and/or comments, don’t hesitate to use the dedicated section below. Hello, Chris. Thank You for the Important Information and on How to Focus your Priorities. Think of an Earthquake as a Series of “Swells”, Just like on the Ocean or on a Very Large Lake. The Near Surface Ground (Composition) will determine the Frequency and Spacing of the waves. We get occasional tremors here in Southern Idaho from the Yellowstone / Sawtooth / Teton Areas. Our soil is heavy clay, Caliche (“hard-pan”).and Lava Rock (Both Pumice and Igneous) which makes our tremors both short and of low amplitude. Dangers in the Home: Turn OFF the GAS LINE FIRST ! – Tall Shelves, free standing and heavy furnishings, and wall hangings are the primary danger. Outdoors is probably less scary and safer. So why do you have a photo illustrating bad practice? Bad idea. Yeah, Matrix. You have to do what you have to do ! Oh FFS… those kids are under cover of a solid object i.e. a desk… as amply illustrated in the very next picture.. Getting under cover of something (i.e. a desk) is infinitely better than suddenly being under cover of a collapsing roof on your head. The basics to me are preparing your house before an earthquake. As soon as we move in we put earthquake latches ( the kind you have to give a quick push at for the door to open, but things falling against it from inside the cupboard cannot open it) on all the cabinet doors. Then we screw all high furniture, bookcases, etc to the wall studs. Always have heavy soles shoes with in reach so if you are in bed when it happens you can quickly put them on.. Walking through glass to get to the door is no fun. Go over the entrances to your house. For instance, I would not go out my front door in a heavy quake. Too much chance of flying glass and rock. Even though we in the US have codes for when houses are built, the way we furnish our houses can make them pretty dangerous in a quake. I also walk through my house before bed every night to check locks and at the same time make sure there are clear passages to doors for any kind of escape…earthquake, fire, storm (tree falling on house) etc. I realize your intention was not to offer a detailed list or description of gear and supplies, but I’d just like to mention that while I will always recommend matches, a lighter, even just a few Bic lighters are good to have and I’d include a magnesium bar and a ferro rod. These are such small and inexpensive things to add and provide greater flexibility. Candles are great except for an earthquake scenario it should be decided that everyone use only flashlights and electric lanterns due to the increased risk of fire from fallen candles or oil lamps. On the subject of water I am tired of people suggesting boiling as those who know better realize that the water is not automatically or guaranteed pure. I am assuming that is why you explained how to create a filter which is good, but it needs to be made clear that the person preparing for a crisis must have the activated carbon or they can simply buy a filter which only costs $20. Much as I like the DIY route, this is a safer choice for most. I think that most people should have books or videos that are more detailed and in depth and explain methods and processes clearly and they won’t be left hanging, second guessing themselves or suddenly not know what to do. 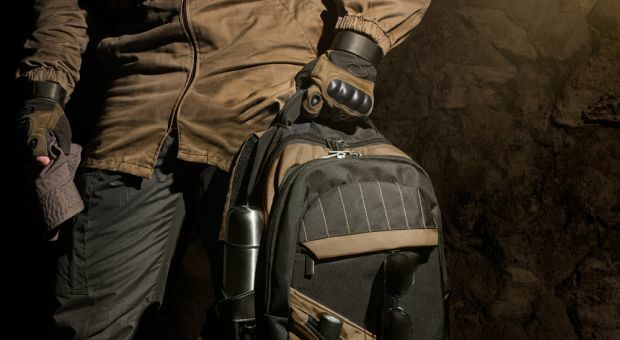 I am also glad you said that a bug out bag is pretty much the same kind of kit you need for most situations. Even if you have a house, you might not be able to sleep in it, so one needs an alternative shelter. You basically can end up camping out. Here are my basics for coping with earthquakes while at home: 1. Never have anything on the wall above your bed headboard that you are not willing to have fall on your head while you are sleeping, 2. Keep a flashlight with charged batteries in the drawer of you nightstand (earthquakes do happen at night and can knock out electric power), 3. Keep a pair of slippers/loafers/moccasins or other easy-on footwear on the floor beside your bed (there will be broken glass on floors if an earthquake hits while you are sleeping), 4. If you have natural gas appliances, keep a gas turn-off wrench leashed to a hook in the wall nearest where the gas service enters your home (turning off the gas service after an earthquake could keep your home from filling with gas and exploding if the earthquake has cracked a gas line), and 5. When choosing furniture, invest in a sturdy metal or wood dining table strong enough to shelter under until rescue should the shaking be so severe you cannot get outdoors. I’d say it all depends on the steel legs. Agree if it is common or garden crap furniture from a store… but I have a bench with 2 x 4 inch profile legs. Stronger than a brick outhouse. I currently live in the Philippines which gets a lot of earthquakes recently. Military personnel from this country often told me that they were always ordered to have their SI, work or even their motorcycle helmets close to their barracks or desks just in case of an earthquake. Aside from the usual stuff, I think this would be a great idea, ask any WW2 vet and they’d tell you that their helmets were more for falling debris than stopping a bullet.